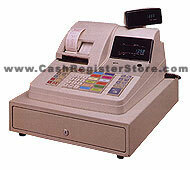 Casio CE-3700 Electronic Cash Registers at Cash Register Store. Equipped with 500 standard plu's. The CE-3700 automatically displays the item price without the need for unit price or department product entry to ensure pricing accuracy. The CE-3700 clerk interrupt system allows multiple clerks to operate in the same transaction, with each clerk being properly credited for the item they sold. Commission rates (max 2) can be calculated on items sold and reported by clerk. Commission calculation can increase productivity, expand your capabilities and at the same time simplify procedures. The CE-3700 is our lowest priced Casio with a full size 5 bill/ 5 coin cash drawer with a removable till, yet featuring receipt and journal printers. 5 payment: cash, check, etc.